Developing a healthy lifestyle is certainly rewarding (for both your health and your attitude), but with the costs of expensive gyms and fancy fitness items, the task can seem a little daunting and discouraging. The good thing is that you don’t have to spend a ton to get in shape! There are so many ways to do it for little to no money. 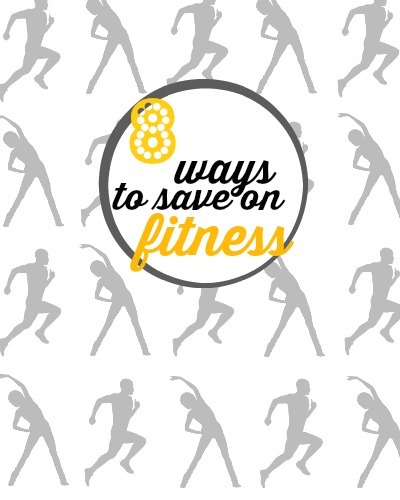 Here’s a list of 8 ways you can save on fitness. 1. Exercise for Free. Gyms can be really pricey and you’re not getting your money’s worth if you don’t use your membership regularly. Instead, opt for exercises that are free: walking, running, dancing, etc. Your neighborhood sidewalks can become your gym. And if your neighborhood doesn’t have sidewalks, take advantage of parks and local schools that have tracks and paths. 2. Watch YouTube. Just because you don’t have a shelf full of fitness DVDs doesn’t mean you can’t workout to an on-screen instructor. YouTube is free and is full of exercise videos! You can find videos on Zumba, yoga, and more and from favorite instructors like Jillian Michaels and Billy Blanks. 3. Download an App. There are a bunch of free apps you can download to your phone designed to promote healthy lifestyles. You’ll find training programs for races, apps that track your caloric intake, and lots more. 4. Grab Inexpensive Items. If you’re wanting to do a little more than walking or running, consider investing in some small items like weights, a jump rope, or a yoga mat. They’re not very expensive and they’re small, so they can be stored easily. 5. Explore Your Gym Options. If you want to join a gym, try looking in alternate places other than the big gyms that have flashy advertising and hefty price tags. Lots of churches offer gyms that are way cheaper. You could also try your local YMCA or keep your eyes peeled for mom ‘n’ pop gyms (they’d probably be a lot more personable, too). 7. Daily Deal Sites. It never hurts to check out sites like Groupon and LivingSocial, which offer deals on local businesses in your area. I often see deals for gyms, personal trainers, and specialized fitness groups. 8. Check your Benefits. It will totally vary from company to company and from provider to provider, but lots of times your insurance benefits will offer discounts or reimbursements on gym memberships (and sometimes other perks, as well). Check with your company to see if any of these discounts apply to you. What other ways do you save on fitness?